Riviera Beach, Fla. — Many say that boxing promoter Don King is known for being a man of many words. 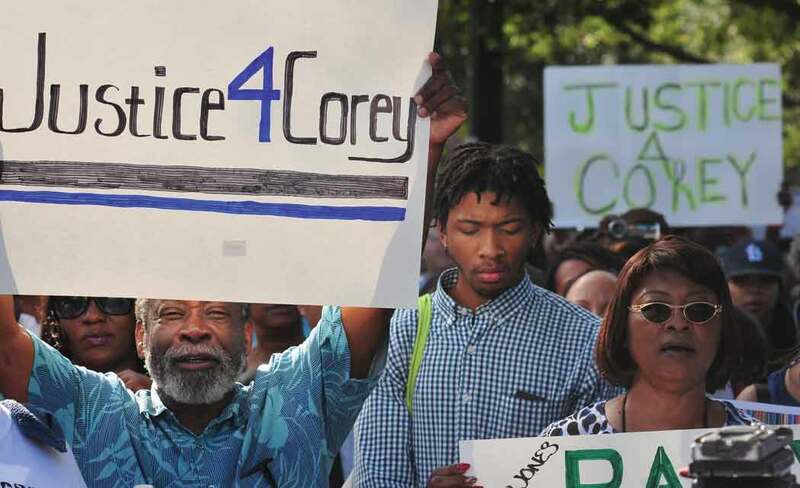 But on Monday night at a “Justice for Corey Jones” rally, held at Hilltop Missionary Baptist Church in Riviera Beach, King put his money where his mouth is. He gave $10,000 in cash to Corey Jones’ family to continue their fight for justice for their slain loved one who was shot to death at the hands of a police officer. Mayor Thomas Masters of Riviera Beach, counted the hundred dollar bills out loud before the crowd of 1500, giving a jubilant shout as he realized it was $10,000. Masters then handed the $10,000 cash over to Corey Jones’ grandfather, the Bishop Sylvester Banks Sr. The total collected for the night was close to $14,000 for the family. Banks said he was humbled and grateful for the outpouring of support. “I feel change coming,” he said. “What goes on in the dark, shall come to light,” he said. Thousands have been coming out, showing their support at various rallies and peaceful protests since 31-year old Jones, a church drummer from Boynton Beach, was gunned down by a plainclothes policeman in an unmarked car on the early morning of October 18. The state attorney’s office says Officer Nouman Raja of the Palm Beach Gardens police department, fired six shots at Jones, striking him at least three times, killing him. Jones had a legally purchased handgun with him, but never fired it, says the state attorney. He had been out at a drumming gig and ran into car trouble on I-95 near the PGA Boulevard exit in Palm Beach Gardens, and was waiting for a tow truck on the side of the road when he wound up shot to death by the officer. The officer has said he thought Jones’ car was an abandoned car, which he stopped to investigate. He says he was confronted by Jones, who had a weapon. Jones family and friends say however, he was a very non-confrontational guy who was mild-mannered and never got in trouble. By all accounts, Jones was known as a law-abiding citizen who loved playing the drums at church and for various bands. “Corey would never, ever, ever go against the law,” said his brother, Clinton, “C.J.” Jones, Jr., who is a former NFL football player. C.J. fought back tears as he gave recollections of his younger brother during a rally held last Thursday in Palm Beach Gardens at the police department. Corey had phoned C.J. as he was stranded on the side of the road on that fateful night, but he told his big brother he was waiting for a tow truck and would be alright. Corey Jones’ best friend and college roommate said he’s never seen Corey angry. “We go back to the sixth grade together. And we lived together for two years in college at University of St. Francis in Fort Wayne, Indiana. I’ve never seen him angry. I’ve never seen him yell at anyone,” said Reverend Clarence S. Ellington, III. There is no dashcam video of the incident, nor was there any body camera on the officer. However, the Palm Beach Post has learned that there may be a recorded phone record documenting the moments before and after Jones’ apparent 3:15 a.m. shooting death by Raja. According to the Post, Jones made a 3:10 a.m. call to the AT &T roadside help line, #HELP. Records show the call lasted 53 minutes. But according to police, Jones was shot and killed by Raja just five minutes after that call. Since the helpline’s calls are recorded, there may be crucial audio capturing the entire incident. If so, that would be key evidence in the case. Meanwhile, the Palm Beach County Sheriff’s Office, which had been investigating the incident, has turned the investigation over to the FBI, much to the community’s delight. Very few in the black community in Palm Beach County, have faith in Sheriff Ric Bradshaw – calling him racist. The FBI was at the scene of the crime Saturday morning collecting evidence in the case. At the Monday night rally, Mayor Masters distributed a petition that he and a delegation plan to take to Washington, D.C. to appeal to Congress next month. The petition calls for an independent investigation into the incident.It also calls for a federal law prohibiting officers in plain clothes and unmarked vehicles from interacting with members of the public without probable cause. He is also calling for all police vehicles to have dashboard cameras, and he is calling for all Palm Beach County officers to wear body cameras. “In our history, anytime we needed justice, we’ve gone to Washington, D.C., “ he said. Palm Beach County State Attorney, Dave Aronburg told the media on Wednesday that “we can’t afford to rush, cut corners or appear to be partial.” He also shared that there would not be a special prosecutor assigned to the case. Palm Beach Gardens Councilman Joseph R. Russo, who is white, was the first to sign the petition. Russo, who has spent over two decades on the Palm Beach Gardens city council, said he is grieved that the incident happened in his city. “Last Sunday was the darkest I’ve ever spent and last week was one of the worst weeks I’ve spent. This gentleman, Corey Jones, should have never been taken from us. I feel the pain because it happened in our city. We can’t let his life be taken in vain. We’re going to make some changes,” he said, garnering a standing ovation from the mostly black crowd. Mayor Masters said Russo was “courageous” to come before the crowd. At the rally held last Thursday in Palm Beach Gardens, thousands showed up with signs and wearing T-shirts in honor of Jones. The national press was on hand as well, capturing the litany of speakers, the chanting, the tears and the singing of gospel songs in honor of a life cut short. Also, a benefit concert, featuring national gospel recording artist, Tye Tribbett, is set for Sunday, Nov. 1 at 7p.m, also at Bible Church of God, 1390 Seacrest Boulevard. Donations will be collected for the family during the concert. Also there is a GoFundMe account set up for those who want to donate to the family online. To access the GoFundMe account, visit www.gofundme.com/justiceforcorey.